FILE - A Delta Air Lines jet sits at a gate at Hartsfield-Jackson Atlanta International Airport in Atlanta, Oct. 13, 2016. Georgia lawmakers punished Atlanta-based Delta Air Lines, March 1, 2018, for its decision to cut business ties with the National Rifle Association. A tax measure, which was stripped of a jet-fuel tax break, passed the GOP-dominated Senate 44-10 and was signed into law. Georgia lawmakers’ decision to punish Delta Air Lines for publicly distancing itself from the National Rifle Association was an extraordinary act of political revenge. Delta recently signed a 20-year lease to keep its hub at Hartsfield-Jackson International Airport in Atlanta, and business consultants said other Atlanta-based firms, such as Coca-Cola and UPS, will likely stay put, too. But GOP lawmakers’ willingness to use public money to try to intimidate corporations could damage Georgia’s ability to attract new industry, including Amazon, which recently named metro Atlanta a finalist for its coveted second headquarters. Amazon didn’t immediately respond to an email seeking comment. FILE - Georgia Lt. Gov. Casey Cagle speaks on the first day of the legislative session at the state Capitol in Atlanta, Jan. 11, 2016. Republican Lt. Gov. 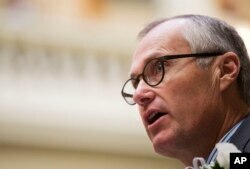 Casey Cagle, who is running in a crowded primary for governor in May, set the stage for the fight with Delta with a tweet Monday saying conservatives would fight back. He defended the move Friday. Another GOP candidate for governor, Secretary of State Brian Kemp, even suggested using the estimated $38 million the state would save by killing jet fuel tax break to pay for a tax-free “holiday” on purchases of guns and ammunition. Other GOP leaders openly cringed at the combative tone Cagle and others took. Republican Gov. Nathan Deal, who is term-limited and serving his final year, bemoaned the controversy as an “unbecoming squabble” fueled by election-year posturing. GOP House Speaker David Ralston called it “not one of our finer days” when the firestorm erupted Monday. Republicans have controlled the governor’s mansion in Georgia since 2003, a deep red streak that makes this year’s GOP gubernatorial nominee a likely favorite in November. Deal and other governors for decades have made it a priority to ensure Georgia was an attractive location for prospective employers, said Charles Bullock, a political science professor at the University of Georgia. Before the NRA controversy, he said, many GOP lawmakers defended the jet fuel tax break as necessary to protect jobs. After Delta announced it was cutting ties with the NRA, it took pro-gun Republicans just days to make good on their threats by passing a sweeping tax bill, minus the jet fuel tax break. Deal, who said an estimated $5.2 billion in overall tax savings was too important to sacrifice, swiftly signed the measure into law Friday. He vowed to keep pursuing the jet fuel exemption as a separate issue. Delta revealed Friday that the NRA discount that triggered the showdown had barely been used. Offered recently for NRA members flying to the group’s 2018 convention in Dallas, only 13 discounted tickets had been sold, Delta spokesman Trebor Banstetter said. The extent of the backlash Georgia might face from businesses is unclear. But firms from outside the South may think twice about Georgia if they see a clash of corporate values on guns and other social issues, said Jon Gabrielsen, a business-strategy consultant who worked 17 years in Georgia before moving recently to Mexico. “If you’re not there yet, why would you want to subject yourself to that potential grief with what the legislature just pulled?” Gabrielsen said.